Queens, NY - Two teenagers are under arrest in the brutal beating that left a Queens yeshiva student seriously injured and hospitalized for over a week. Police said that 18 year old Jonathan Torres of Flushing and 17 year old Victor Hidalgo of the City Line section of Brooklyn were taken into custody yesterday and charged with gang assault in the first degree and assault in the second degree in an incident that took place just before 5 PM on November 29th in the vicinity of 64th Road and 108th Street. The two were with an unknown number of individuals who punched, kicked and threw a 16 year old victim to the ground before fleeing the scene, according to the NYPD which is not currently classifying the incident as a hate crime. Assemblyman Daniel Rosenthal said that he has been in close contact with the NYPD and the Queens County District Attorney’s Office and that an investigation appears to indicate that the incident cannot legally be classified as a hate crime. Yaniv Meirov, president and CEO of Chazaq which does religious outreach within the Queens Bukharian Jewish community, identified the victim as David Paltiel. According to Meirov, the incident stemmed from a previous altercation at nearby Forest Hills High School involving groups of Bukharian and Hispanic students, with Paltiel deliberately targeted because he was visibly Jewish. Paltiel, a student at the nearby Yeshiva L’Maan Achai does not attend Forest Hills High School. 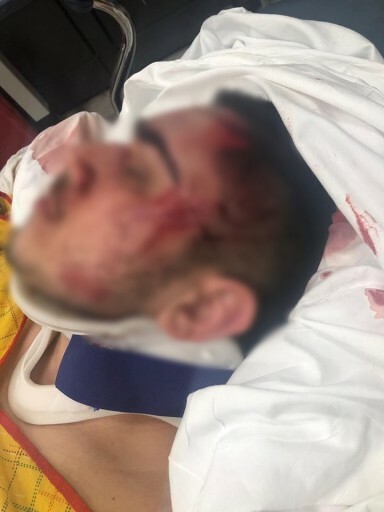 The NYPD confirmed that a second 17 year old victim was surrounded by a group of teenagers who pushed, shoved and punched him, at the same time and location, leaving him with a laceration to his lower lip. No arrests have been made yet in that incident but police said that 11 individuals are currently in custody in connection with the beating of the two teens. A Monday night meeting had members of the local Jewish communities speaking with elected officials and law enforcement about their concerns, including an apparent lack of communication between police and community leaders. The incidents were discussed again on Thursday night at a previously scheduled monthly Build the Block public safety meeting at the Queens Community Center hosted by the 112th Precinct. Meirov that he is hopeful that video footage of the beating that has people shouting “kill the Jews” and “kill the Bukharians” will have the NYPD adding hate crimes charges for Torres and Hidalgo and noted that there has been increased police presence in the area in recent days. How is it a "case of mistaken identity" if the attackers were yelling "kill the Jews". So is it less of a hate crime "if" the attackers thought the victims were Bukharian? I would ask the following. Would it be a hate crime if an attacker yelled "kill the Hispanic" while attacking an Hispanic? we absolutely NEED TO PROTEST outside of that precinct. why is mr. meirav lauding the police. quoted as saying great job??? how about we want justice??? these punks are nothing but savages that will no doubt inflict more harm on yidden if we just give them a slap on the wrist. Meirov is an ignorant and totally uneducated publicity hound. He is a VERY poor spokesman who represents himself and his equally uneducated brother (MAYBE a high school diploma). The community would do better to have wiser spokespeople to the police and political establishments. Why do these Spics keep attacking religious Jews? I agree with comments of #1. Additionally if he was singled out as a visible Jew, all that NYPD is doing is caving into the liberalism dictated by the Mayor. Had this been a white on black attack, the Mayor and his crew of misfits would be all over this. I guess you would have preferred toxic Hillary who would have turned on Israel. Donald John Trump is the best friend Israel has ever had of all our Presidents. Your blind hatred is pathetic. He has talent: he waits for some shul or organization to plan an event and then gets his name put on their event and publicizes himself (Chazak) as creator of the event. Here he is far from smart enough to deal with the police, etc. Maybe because we call them spics? bla bla bla bla bla bla bla bla. Imbecile. Really??? There was no anti-Semitism before this ridiculous excuse of a president was elected ??? The truth about him is bad enough, no reason to invent fairy tales. these are latinos possibly illegal, if they are charged and found guilty then they may get deported but alas thanks to Aguda supported de blasio that wont happen as NYC is a sanctuary city. is meirov the equivalent to sperlin in crown heights? Not wise??? ?Isn't he a product of our secular education avoiding Yeshiva system? To #8- Do you see instances where religious Jews, attack Hispanics, wise guy? “ we absolutely NEED TO PROTEST outside of that precinct. why is mr. meirav lauding the police. quoted as saying great job??? how about we want justice??? Remember we’re galus yiddn. Although we need justice We hafta stay quiet and respect our law enforcers. And pray a lot. “ I guess you would have preferred toxic Hillary who would have turned on Israel. Donald John Trump is the best friend Israel has ever had of all our Presidents. Trump is the best friend ISRAEL has ever had but never benefited a single Jew. Although Im a Trump fan, I have no problem if calling it the way it is.